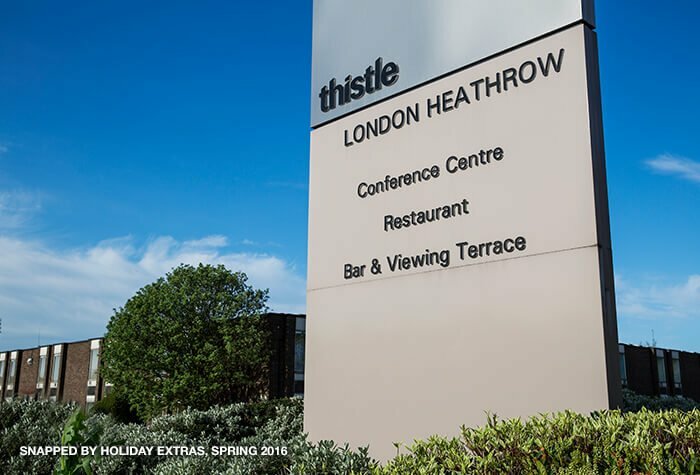 The Thistle is the perfect Heathrow Airport hotel for plane-spotters: it overlooks the Terminal 5 runway. The hotel itself is contemporary and comfortable, with free, unlimited wifi throughout, and staff that really go out of their way to welcome you. Another thing that's attractive about the Thistle is its location; most hotels are on the Heathrow strip along the A4, making them ideal for transfers to either: Terminal 2, Terminal 3, Terminal 4, or Terminal 5 - but the Thistle is perfectly placed between all so no matter where youre flying from, you can reach any terminal in a matter of minutes. Plane-lovers certainly won't want to miss out on dinner in the hotel's First Edition restaurant, which has a prime view of the runway ... and the menu's pretty good, too. 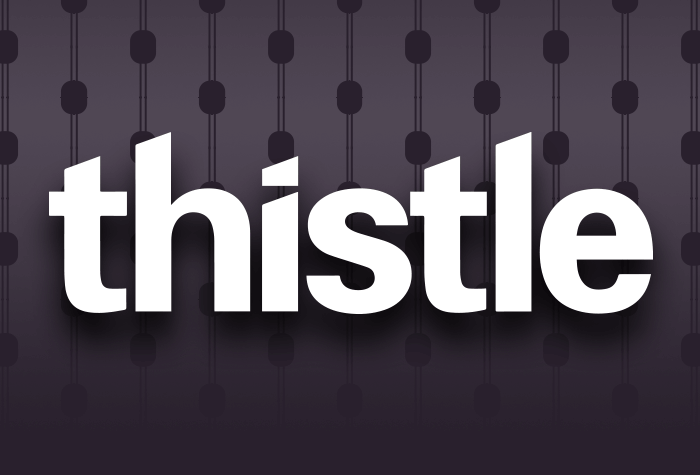 If youre travelling to the airport by car, the Thistle is a great park and fly hotel. 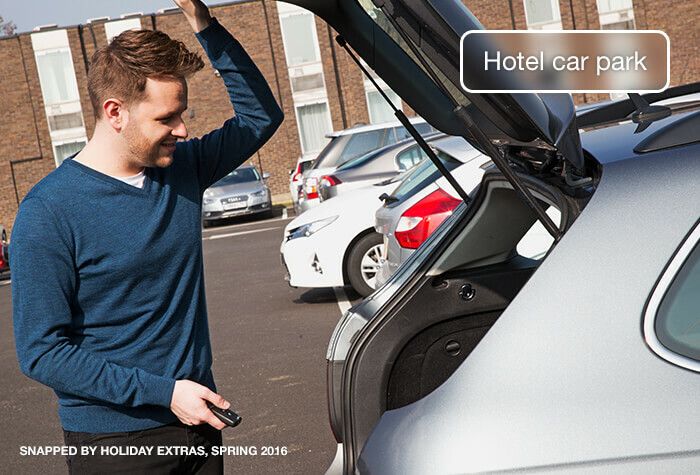 It has 600 spaces on site, so there's plenty of room to leave your car securely while you enjoy your holiday. Transfer links are good too: the Heathrow Hoppa pulls right up to the front door, or you can catch the free Heathrow bus from the street to terminal 5 or to Heathrow central for terminals 1, 3 and 4. Families: There are plenty of triple rooms, interconnecting rooms or family suites. Parking: On-site parking is easy because transfers are available day and night from outside the hotel. 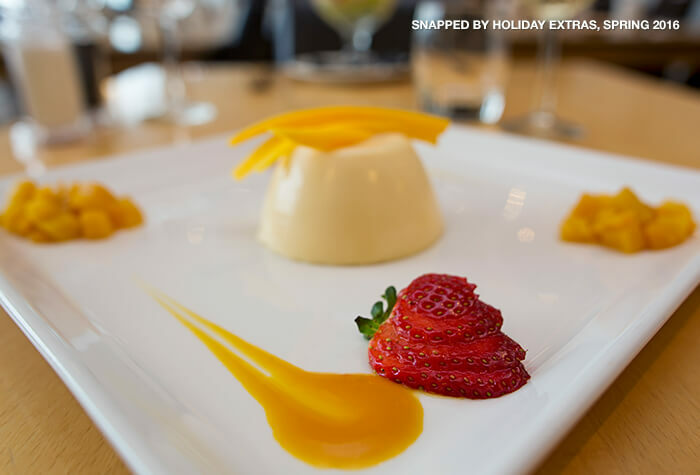 Dining: With a large glass-walled dining room and sun patio directly overlooking the airport, you cant beat the Thistle for spectacular views while you dine. Fitness enthusiasts: Thistle guests have access to the Spring Health Leisure Club, which is opposite the hotel. It has a large swimming and spa pool, a separate ladies' gym, a weights room, a spinning studio, steam room and a boxing studio, and costs £10 per guest. You can check in from 2pm; you must check out by noon. 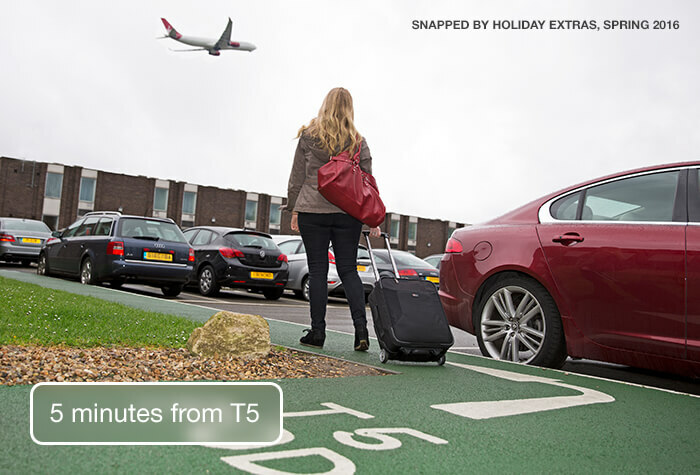 Its a 5-minute POD shuttle to T5, which costs £5 per person each way. The POD car park is next to the Thistle hotel. To get to all other terminals, wed recommend taking the POD to T5, then the free Heathrow Express train to your terminal. Alternatively, the Heathrow Hoppa shuttle bus runs regularly during the airports opening hours. The bus stops at other hotels on the way, so it can take between 10 and 50 minutes. Travelling to the hotel by train? Heathrow T5 train station is closest to the hotel - its a 5-minute POD ride away. Hotel check-in is from 2pm and check-out by is by 12 noon. Overnight parking at the hotel is £12 and subject to availability. Driving directions and a postcode for satnavs will be on your booking confirmation. If you need parking for the whole of your holiday search for hotel and parking package with us. When we visited we found the rooms to be simple and functional. They are on the small side, but theyre practical for an overnight stay. Although its close to the airport, you wouldnt know with the triple-glazed windows in every room. 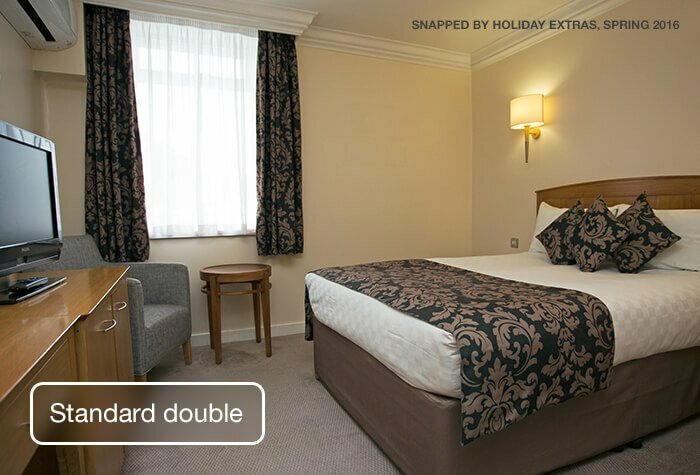 If you book a triple room it includes a double and single bed, or three singles. Children are classed as 16 and under. Its free throughout the hotel. 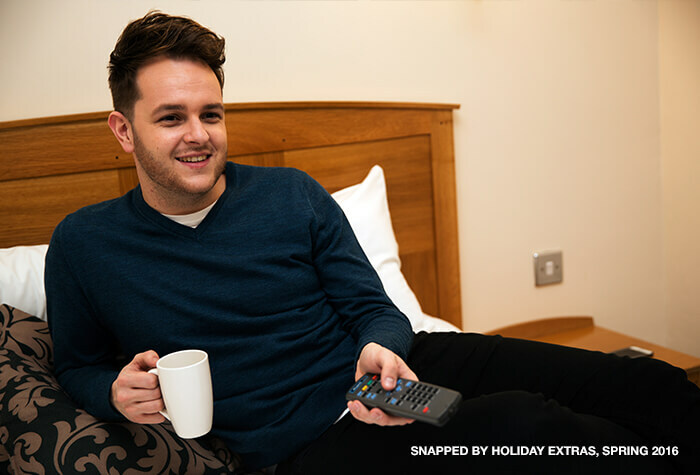 Guests have said its intermittent in the evenings, so wed suggest using your phone data if you have trouble connecting. 5 accessible bays at the hotel entrance. There are no lifts and no fully accessible rooms at the Thistle but there are ground floor rooms that can be reached by wheelchair users. 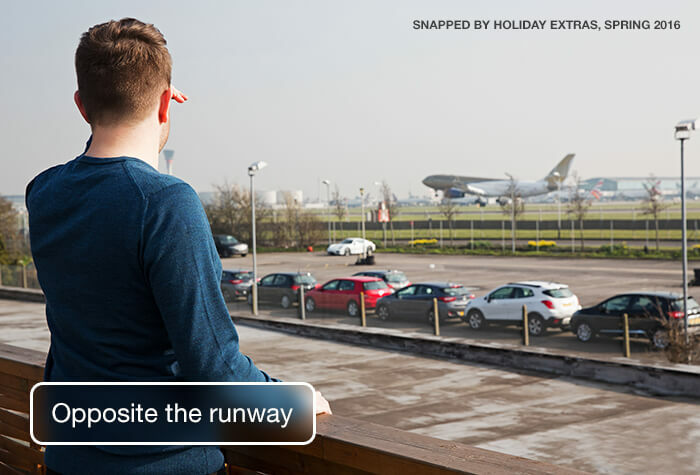 The Runway restaurant speaks for itself, as it gives guests a great view of the runway. 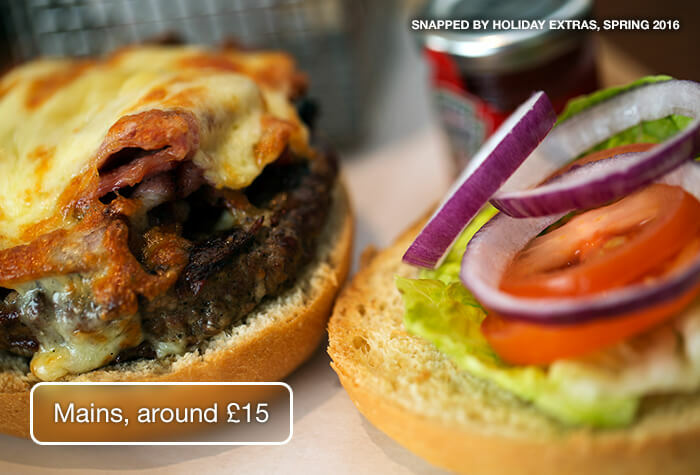 It offers meals like burgers, fish and chips, curries and salads. 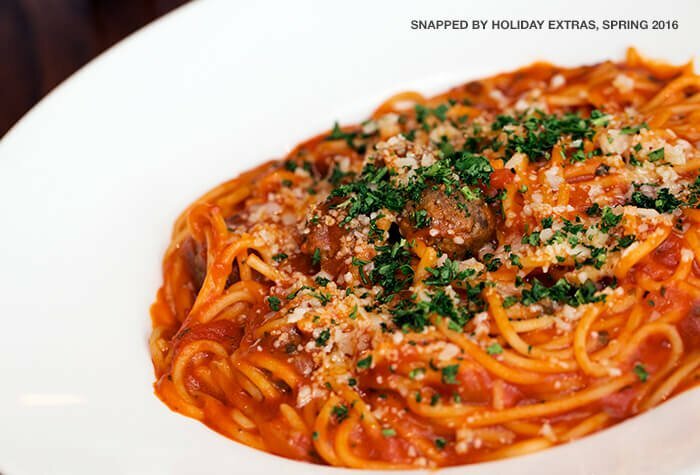 Guests say that although the menu is limited, the food comes out really quickly. A main costs around £15. 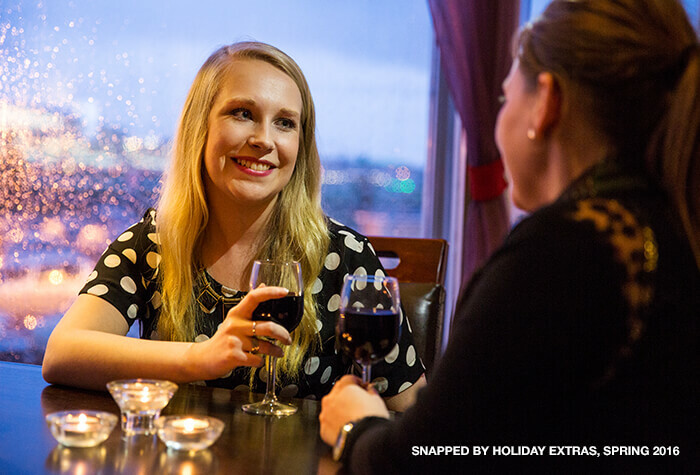 The Thistle bar again overlooks the runway and has a small selection of beers, wines, spirits and soft drinks. 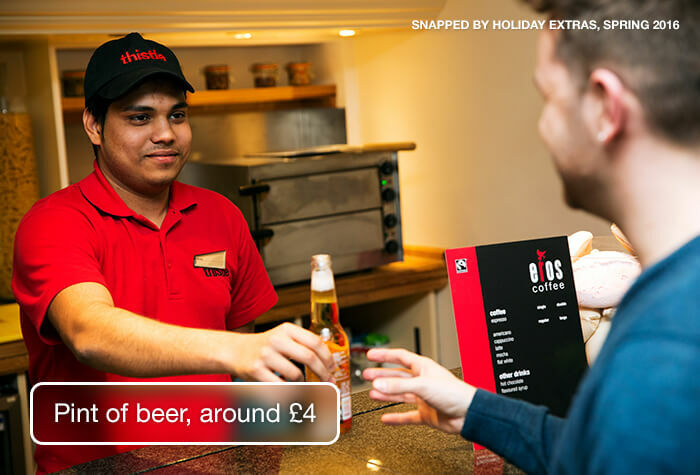 An average beer costs around £4. 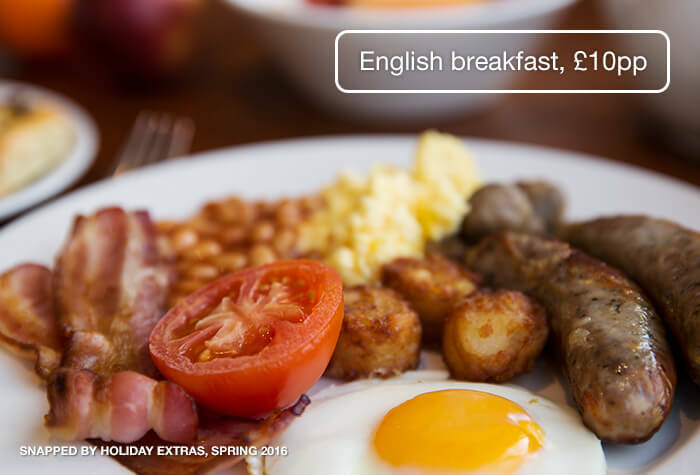 Its a full English and continental buffet for £10 pp. You can eat as much as you like. 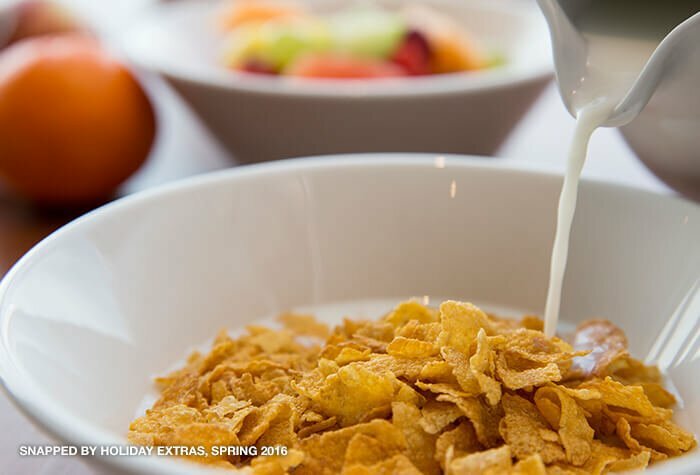 Expect all the staple items, as well as omelettes made to order. When we visited we found there to be a great selection of food, making it a great value for money. 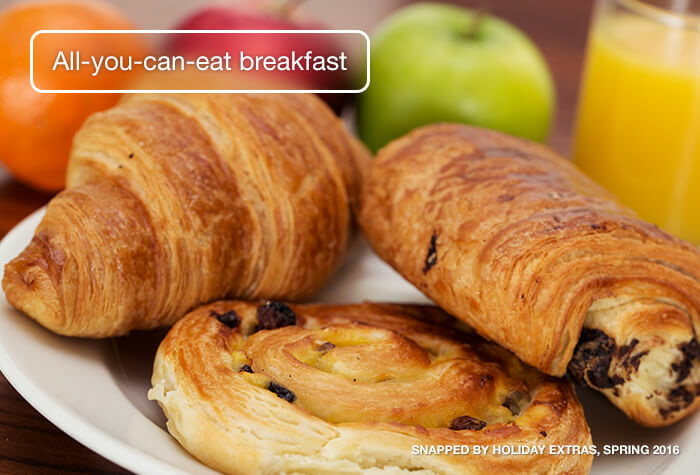 Tip: If youre travelling before 6am, ask at reception for a breakfast-to-go bag, which includes fruit and yoghurt. 6am - 10.30am weekends and Bank holidays. The lobby coffee shop serves hot drinks and cakes. The 24-hour grab and go fridge offers sandwiches, salads and bottled drinks. Theres no lift, but the porter can help carry your luggage to your room. Wed recommend requesting a room on the ground floor for convenience. Disabled facilities There are no disabled facilities at this hotel. Hotel rooms a bit tired but who cares. It does the job and it's not overly expensive. Closeness to T5 a huge advantage. Hotel is ideal as an overnight stop before an early flight. 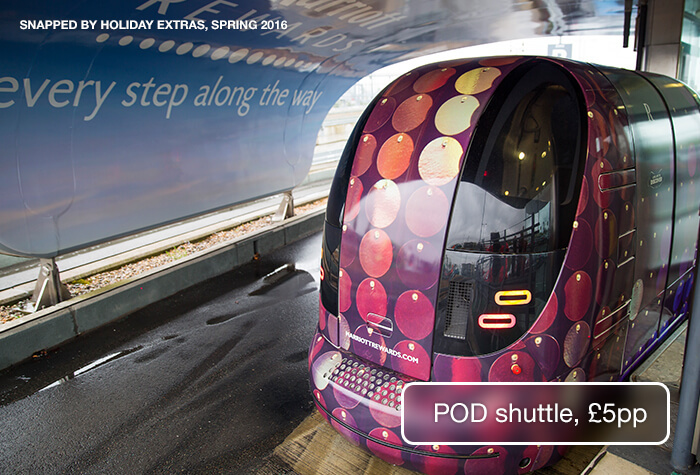 The pod system is a great way to go from the hotel to the airport but I have two issues with it. Firstly, it would be great if the body was not such a long, uncovered, walk from the hotel. Secondly, for goodness sake put some proper signage into arrivals to indicate where to pick up the pod. We spent more than 15 minutes walking up and down looking for where we had to go. Airport personnel did not know and the information station was unmanned. This is a super system let down by this. Fantastic location so easy for getting to and from terminal five. The pod system is very easy to use but there is also regular London buses that donâ€t take any longer and is part of the oyster system so is much cheaper. I only used to pod system on the morning of my flight as I had slot of luggage and it was easier than a bus. The hotel was comfortable and considering it was at the end of the runway it wasnâ€t really that noisy. Breakfast and the hotel was good I did it at the hotel as I wasnâ€t sure of plans. For £10 it was good and a good choice and a lot cheaper than eating in the terminal. I would recommend and stay here again. Our customers rated Thistle Hotel Heathrow on average 9/10 (1264 reviews). Read Thistle Hotel Heathrow reviews.